I recently had the honor of being invited to what sounded like a “serious” little party. Actually, it was a “cereus” party, named for a night-blooming cactus. This party was called at the spur of the moment to coincide with the plant’s blooming, which occurs for just a few nights each year. A cereus cactus is not much to look at when it’s not in bloom. The spineless cactus being honored at the party I attended had pods of flat, shiny leaves jointed together. Through winter, I was told, it looked downright unhappy. [post_ads]And cereus is no small plant that can be spirited away into some quiet corner when it’s looking its worst. It quickly grows to enormous proportions. The plant I saw was in a hanging basket with the tips of its stems dangling on one side 5 feet across from those on the other side. 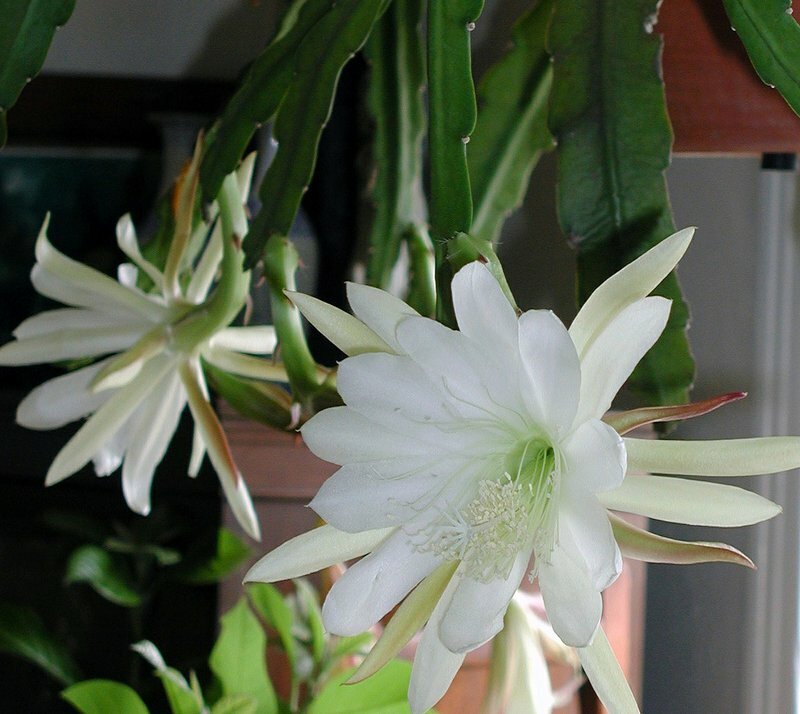 Cereus will survive pruning, but must be allowed to grow large if it’s going to make flowers. As I stepped out onto the terrace to meet the plant, I immediately was swept up in its sweet, musky aroma. The creamy white blossoms, each 5 inches across and comprised of layer upon layer of strappy petals, were as breathtaking to the eyes as to the nose. Pouring out of the center of each blossom was a filagree of stamens, also creamy white. Fat, spiny, expectant buds foretold more blossoms to come later that evening. Some types of night-blooming cereus can be even more dramatic; there’s one with even larger blooms, up to a foot across. The plant of this species, botanically not really cereus, but hylocereus, is commensurately larger, and its stems have sharp, three-cornered edges.